Well, most of them, anyway! Donald Trump has a lot of things to say about global warming. He’s called it an urgent problem, and he’s called it a hoax. He’s claimed it’s a scam invented by the Chinese, and he’s denied ever saying that. For those keeping score at home, here’s a timeline of the Donald’s thoughts and actions on global warming. We’ll update it from time to time. Read the full the letter at Grist. Jan. 2014: Trump says scientists are in on the hoax. On January 6, Trump went on Fox News to discuss a severe cold snap that set records across the country. “This winter is brutal,” said Trump, adding that climate change is a “hoax” perpetrated by “scientists [who] are having a lot of fun.” Trump kept up this line of argument throughout the long and miserable winter. 12/5/16: Donald and Ivanka Trump meet with Al Gore. Ivanka Trump will meet today with Al Gore! 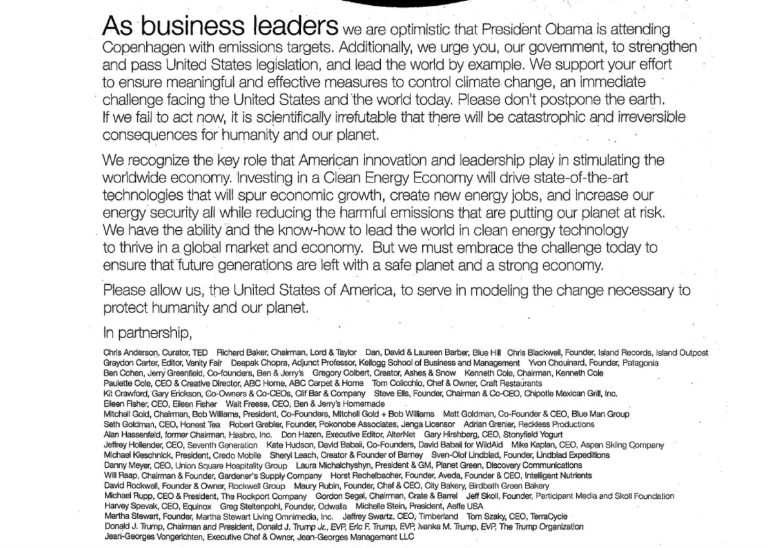 to talk climate change today, the transition announces. 3/15/17: Trump administration will revisit fuel standards. At an event in Detroit, Trump announced plans to reexamine the tougher fuel efficiency standards for vehicles enacted by the Obama administration. 3/28/17: Trump signs executive order gutting many of Obama’s climate policies, including the Clean Power Plan. Just days after the spectacular failure of his health care bill, Trump ordered his administration to revisit the Clean Power Plan, with the intention of gutting Obama’s landmark restrictions on power plant emissions. 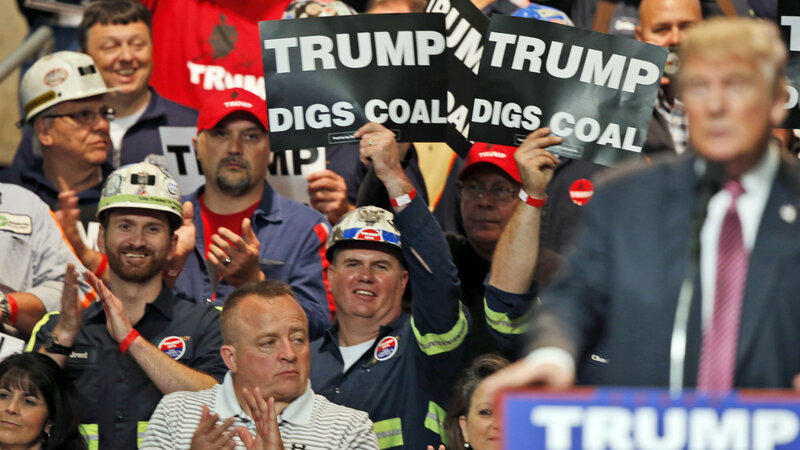 Trump also reversed an Obama-era moratorium on new coal leases on public lands, directed his team to revise Obama’s methane regulations, and instructed the EPA to ignore its current calculation of the cost of carbon pollution. Trump did leave the Paris agreement in place, at least for the time being. 6/1/17: Trump announces he will pull out of Paris deal. In a speech in the White House Rose Garden, Trump announced his plan to withdraw the United States from the Paris climate deal. The president said he was open to renegotiating the agreement, but foreign leaders quickly made clear that wasn’t possible. Nov. 2018: Finland spends “a lot of time on raking.” As more deadly wildfires tore through California, experts pointed out that warmer temperatures are making are making the problem worse. Trump had a different theory, faulting the state for poor “forest management” and threatening to cut off federal funds—comments that drew derision from firefighters. Trump later explained that California’s forests should have been “all raked out” to prevent fires. He also claimed that the president of the Finland told him the Scandinavian country spends “a lot of time on raking and cleaning and doing things, and they don’t have any problem.” Finland’s president, Sauli Niinistö, told the media that he didn’t recall saying that to Trump. Thanksgiving Weekend, 2018: It’s cold again! This is the coldest weather in the history of the Thanksgiving Day Parade in NYC, and one of the coldest Thanksgivings on record! 12/1/18: “The United States reiterates its decision to withdraw from the Paris Agreement.” Just days before negotiators were set to convene in Poland for a new round of global climate talks, the Trump administration was the lone dissenter from a G20 statement reaffirming support for the Paris agreement. “The United States reiterates its decision to withdraw from the Paris Agreement, and affirms its strong commitment to economic growth and energy access and security, utilizing all energy sources and technologies, while protecting the environment,” the administration said. Dec. 2018: Trump gloats about Paris riots. In a series of tweets about the protests and violent riots in France sparked by President Emmanuel Macron’s attempt to impose higher fuel taxes, Trump claimed that the unrest had been caused by the “fatally flawed” Paris agreement. 12/8/18: Trump sides with authoritarian petrostates in refusing to endorse climate report. At the climate talks in Poland, the United States joined Russia, Saudi Arabia, and Kuwait in declining to “welcome” a major UN study warning of the dangers of global warming. “The United States has not endorsed the findings of the report,” the State Department said, according to CNN. The US delegation was subsequently heckled at the conference when it led a panel discussion promoting the use of fossil fuels. This story has been updated. Natalie Schreyer and Rebecca Leber contributed to this article.